The Sun is high in the sky in summer. Do you think some things get hotter than others in sunlight? Which does the Sun warm more? Place a cup of water and a cup of sand each in a sunny place. Did the sand or water get hotter in the Sun? Repeat the activity using a thermometer. Were your results the same? 1. How do you know when it is summer? You step outside and feel the hot Sun on your face. It is summer. Summer is the season after spring. People might spend more time outside in summer. There are more hours of sunlight in summer than in any other season. Some animals have adapted to the hot Sun. Other animals look for shade to stay cool. 2. What do you like to do in summer? If you woke up at 7A.M. would it be light outside? 4. What is summer weather like? In most places in California, it is hot and dry in the summer.Deserts have very hot summers. 5. Summers might be cooler near the water or in the forest. Why do you need to wear sunblock when you are outside? Look closely at the pictures. What is the same in each picture? What is the defferent? What season does each picture show? Write about one of the pictures. Describe the weather and what you think it would feel like if you were there? Ethan lives in California. He recorded date about rainy days where he lives. 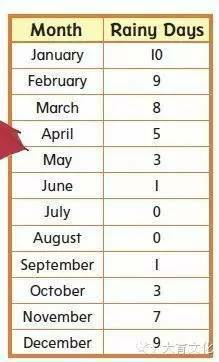 How many rainy days were there in June, July, and August? Add them up. What season do you think it is? 3. A table shows data in an organized way.